While the Anglo-Saxons understood natural science within a framework of Christian doctrine, it represented a secular facet of their knowledge. This manuscript contains a calendar, a map of the world, astronomical materials, and a 'Marvels of the East' (on the strange inhabitants of other parts of the world). Written in Old English and Latin, it is one of the most lavishly illustrated secular books of the early middle ages. Nonetheless, its origins are not easily determined. Its features point to Canterbury, Winchester and Gloucester, with current opinion supporting Christ Church, Canterbury. How it was used is unknown: it is so unique nothing compares with it. In the 12th century it belonged to the library of Battle Abbey. Each month of the calendar has at its top a landscape with figures to represent the labour of the month, a conventional series of occupations associated with each month. 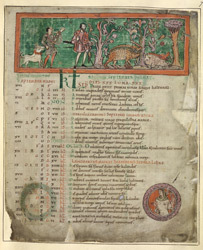 A scene of boar hunting represents September / October, with the zodiacal sign Virgo (the maiden) represented in a roundel in the lower right corner. Below the picture, the number of lunar and solar days in September are noted, while the setting of the constellation Pleiades ('septem astra cadunt') and the movement of the sun into Libra ('sol in librum') are written in larger letters than most of the saints' feast days.